Love chocolate mousse but looking for a recipe that's a little different than the classic and one that's jam-packed with interesting flavors? If so, check out this guest-post recipe by Chef Anthony Stewart, courtesy of the Pritikin Longevity Center + Spa. In a 400-degree F oven, bake the sweet potatoes, each wrapped in foil, until their syrupy juices start to seep out, usually about 1 hour. Cool. Then peel and crush them. The yield should be 3 cups. In a medium mixing bowl, combine cocoa powder, Splenda, water, and vanilla extract. Mix well, using a whisk or wooden spoon, until smooth. Add cocoa mixture, sweet potatoes, and blueberries to food processor. Puree until smooth. Chill. In a medium nonstick sauté pan, combine chopped apples and apple juice concentrate. Simmer over low heat, stirring occasionally, until apples are soft, about 10 minutes. Scoop mixture into food processor, and pulse until smooth. Cool and refrigerate. Divide dessert into individual parfait glasses. Spoon in apple butter. Top with a do llop of mousse. If desired, garnish with raspberries and a sprig of mint. This is a very different recipe. I have never tried a chocolate mousse made with sweet potato, but I am very willing to give it a try. 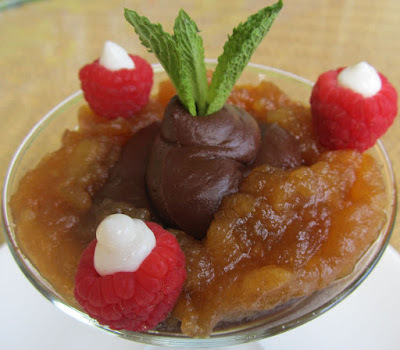 It seems that the apple butter is as important to the recipe as the mousse.